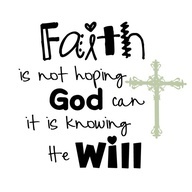 Walking in faith leaves no room for second guessing. When in doubt get God out. Open to Psalms. Proverbs. These two chapters are written by father and son. King David and King Solomon. Both men are human beings just like us. They both have fallen down. But were picked back up by their faith. God sees all and when decisions have to be made, just listen, be aware. The answer will come. It will be confirmed. And you will not regret it. God has your best interest at heart. It is the other "cat" that is so deceptive. Be careful not to listen to false hope. You will be left hanging. And yes, doubt, wishing you would've, could've, and should've all suffice. 1 Corinthians 16:13 Be on your guard stand firm in the faith; be men of courage; be strong.